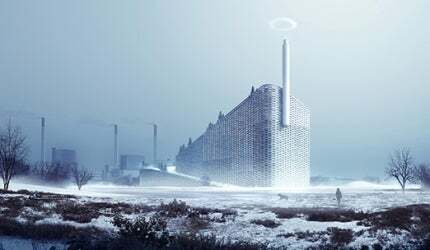 Amager Bakke waste-to-energy plant will replace an existing plant built in 1970. Image courtesy of BIG-Bjarke Ingels Group. The new plant has been designed to serve as an urban attraction for the people of Denmark. Image courtesy of BIG-Bjarke Ingels Group. The waste-to-energy plant will feature a 31,000m&#178; ski slope on its roof. Image courtesy of BIG-Bjarke Ingels Group. The plant has a very high environmental efficiency, which has enabled it to be located close to the Copenhagen city. Image courtesy of BIG-Bjarke Ingels Group. The facade of the plant features planter modules arranged like bricks. Image courtesy of BIG-Bjarke Ingels Group. The plant’s smokestack will take visitors to the roof to enjoy the views. Image courtesy of BIG-Bjarke Ingels Group. The roof of the plant will feature 1,500m of ski runs of varying skill levels. Image courtesy of BIG-Bjarke Ingels Group. The plant will emit smoke rings which can be illuminated using lasers. Image courtesy of BIG-Bjarke Ingels Group. The Amager Bakke waste-to-energy plant is being built on the outskirts of Copenhagen in Denmark. Amager Ressourcecenter, a waste management company based in Copenhagen, is developing the project. Designed by BIG-Bjarke Ingels Group, the new plant will replace an existing one, which has been operating since 1970. BIG-Bjarke Ingels Group’s design was selected in January 2011 out of 36 international proposals through an international competition held by Amager Ressourcecenter. Other shortlisted architects were Wilkinson Eyre Architects, Dominique Perrault Architecture, 3xN, Lundgaard & Tranberg Architects, and Gottlieb Paludan Architects. "The waste-to-energy facility features a ski-slope on its roof, the first of its kind Denmark." The waste-to-energy facility features a ski-slope on its roof, the first of its kind Denmark. It will be an energy efficient and environment friendly facility, and is expected to become an urban attraction for the people in Denmark. Construction on the €470m ($611m) project started in March 2013 and is expected to be completed by 2016. When finished, the plant will convert 400,000t of waste annually to generate low-carbon electricity and supply heat to 150,000 households in Copenhagen. The Amager Bakke plant is located next to the marina in an industrial area close to Copenhagen city. The aim of the project was to integrate all these elements and create a new destination in Copenhagen. The ski slope of the building was designed as part of achieving the same. The roof of the building will be open to the general public and feature the 31,000m² ski slope. The plant will feature a smokestack, which will emit smoke rings for every tonne of fossil carbon dioxide released, instead of the conventional continuous stream of smoke. The smoke rings can be illuminated using lasers to create art forms. Skidome is a proposed snowflake-shaped ski dome being planned for construction over River Guden in the city of Randers in Denmark. Upon its completion, the new ski dome will replace the 22,500m² ski dome in Dubai as the world’s largest ski dome. The plant’s smokestack will include an indoor glass-walled elevator that will take visitors to a vantage point on the roof. The vantage point and the ski slope will connect the city with the industry. The smokestack will enable visitors to view the internal workings of the plant, and house an indoor vantage point and cafe. Visitors will be able to enjoy the views of Copenhagen and southern Sweden at the top of the 90m-high building through the vantage point. They can also ski down the 1,500m-long green, blue and black pistes of varying skill levels. The area surrounding the plant will be developed into a park for various sports during the summer and winter. A path system will be developed throughout the park, which will connect the site with the neighbouring residential area. The 74,000m² facade has been designed to change the image of the plant. The facade consists of a series of planter modules assembled like bricks. Windows in between these modules face an interior atrium. As a result, the plant seems to be covered by a vertical green facade when viewed from a distance. "The high environmental efficiency of the plant has enabled it to be located close to Copenhagen city." The plant will use the latest equipment and technologies including flue gas condensation and heat pumps to achieve a total energy efficiency rating of 107%. The rating is a 25% increase in efficiency over the existing facility and the highest in the world for a waste-to-energy facility. The increased efficiency will help the Municipality of Copenhagen to reduce its carbon emissions by 107,000t per year. The facility will also be fitted with advanced flue gas cleaning equipment, which will reduce emissions to become the lowest in the world. The plan will also capture rainwater and use daylight filters. The high environmental efficiency of the plant has enabled it to be located close to Copenhagen city. New apartments are also planned to be built near the facility. Ramboll is providing planning and commissioning services for the project. Realities:united is responsible for the smoke ring generator. Landscaping architect is Topotek/Man Made Land. AKT is providing facade and structural consulting services for the project.